Dreadbox synth have become quite popular for small boutique synth manufacturer. I spent my tax returns on Dreadbox Nyx. It having dual filter and individual glide for each oscillator made it interesting enough to buy. Dual filter can be two low pass filters, two high pass filters, one low pass filter and one high pass filter or one low pass or high pass filter. 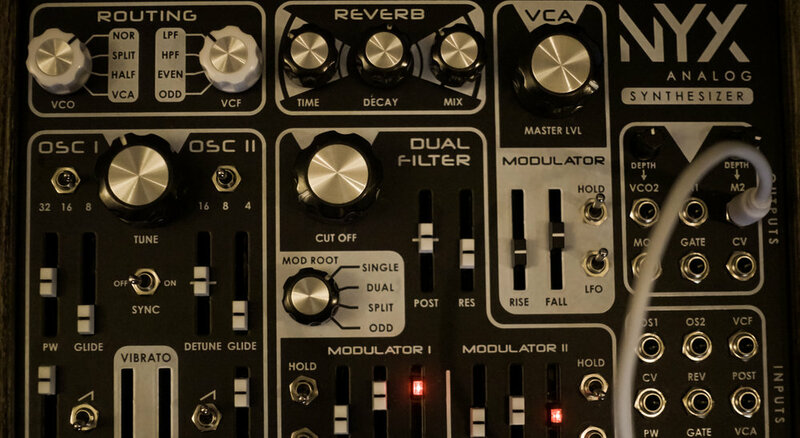 You can send oscillators into different filters if you want. This made Nyx more interesting than Erebus which is more popular of two. I am not sure if Nyx is ingenious or weird for weirdness' sake. And I am not sure if my Nyx is broken or not. Pulse width control works weirdly. If I take it above half way point oscillator goes silent. This feels like it is broken. When I add modulation to pulse width this gives me control of how fast and when oscillator come audible. I am not sure if this was intended functionality or I was lucky broken unit works like this. I didn't see mentions of this in manual. I am not returning the unit. This could give interesting sound when I figure the instrument. One weird choice was to have unison/paraphony switch inside the unit. Erebus had in on top of the unit. You have to take the bottom off to get to the switch. By default it was on paraphony mode. I think unison works better than paraphony. I will keep it on unison mode. Easier access to paraphony mode would have been nice. You have to take the bottom off to get midi channel settings. That is not as big deal since you set channel to which suits your setup and it is done. You can select midi channels between two and seven or omni. Might cause problems if you have lot of midi gear with similar restrictions. Nyx takes some time to learn. I don't pretend to know what it is capable of yet. I will show it in next week's video. At least what I have learned by then. Bigger thing than instrument itself was it made me reconsider my synth shopping list. It is analog synth without digital control. It made me remember how hard to play those could be. That is part of the fun but I also like to have oscillators in tune without constant tuning. Maybe I don't need that huge eurorack system or many expensive completely analog synths. This doesn't mean Dreadbox Nyx is bad synth. It is weird boutique synth which might or might not be ingenious. These were my initial thoughts after playing with it for the first time. I may think differently after I have learned it. At the moment I am not as excited as I expected to be. It is probably because I haven't figured it out yet.